“Can’t we pay someone to do this?” my husband asked. He was delivering his second wheelbarrow of mulch to my side and trying his hand at weeding for the first time in our 19-year history of home ownership. While he loves the outdoors, Chris prefers that his fresh air experiences involve skis on his feet or a boat keeping him afloat. As one who comes from a family of gardeners and wildlife admirers, it is beyond my comprehension how Chris could perceive yard play as work. I think that the real issue is that he doesn’t feel part of the story that is playing out in front of him; stories of relationships with friends and family. These are stories that don’t have an ending, but they continue to unfold. While one can garden alone, there is generally a history of community and friendship involved. For me, digging in the soil generates memories of friendship. I have a beautiful ground cover of native ginger that was given to me by a friend, Kim. This week I passed some along to another friend, Nicole. My hearts-a-bursting, (native Euonymus) were a gift from Ellen. They are spectacular in the fall, so I would like to plant the runners myself and help it along as it establishes itself on the bank. A family friend, Kelsey, now 15, loves lamb’s ear because it is soft and it reminds her of her mother. I keep it growing in remembrance of her. My friend Ria planted borage after my back surgery five years ago and it continues to re-sow itself, every edible periwinkle flower reminding me of her. There are plants in my yard that reflect my family history too. For Christmas my mother gave me an 80-year old Kingsville boxwood, propagated by my grandfather. That tiny, miniature boxwood is a treasure to me. In another corner, I am reminded of Aunt Derrick and Uncle Heidi. (Yes, that is really what we call them.) They gave my daughter a gorgeous Southern magnolia for her baptism. Elsewhere in the yard, I see lupines that Liza planted. She was 6 when we planted a flat of seeds. Only six germinated, and two survived transplanting. Those two have gone on to reproduce prolifically. Some of those lupine babies went to live with my friend Marie. Sometimes the stories of friends and family come together. 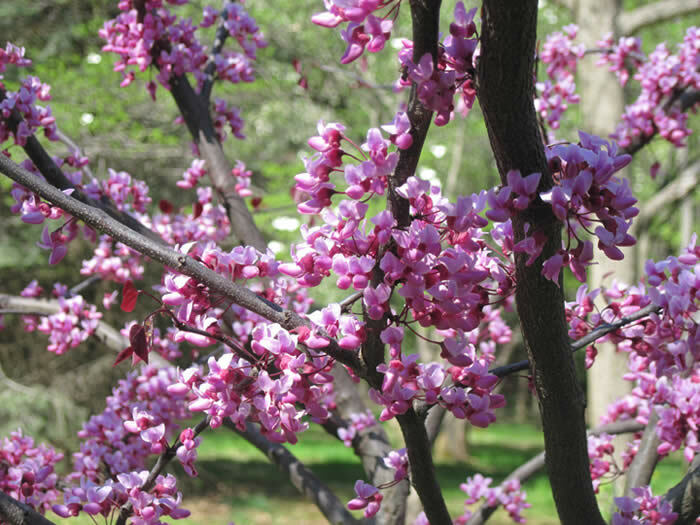 There is a redbud growing by the creek that was a gift from my sister, Annie. Ria taught me that the pea-like magenta flowers are edible and full of vitamin C. I have in turn taught many children to eat redbud flowers. If this story unfolds according to plan, my own children will pass this fact along to my grandchildren. Then they too will enjoy munching on the purple buds just for the novelty of it. I don’t know exactly how this story ends, but I am going to enjoy being filthy dirty as I witness how it unfolds. To answer Chris’ original question, of course we could get help with the yard. We have done that in the past and I will get help if I feel that I really need it. But I want to manage the beds in my yard myself so I can keep a lookout for lupine babies that take me back to a time that I can remember fondly, but I can’t relive. I want to mulch, water and tend all these plants myself because I would like to have a hand in this story as it is written.